Medicinal uses: Catnip is settling to the stomach and a gentle sedative. Since it powerfully stimulates sweating, it also reduces fever. Its pleasant taste and gentle action make it a suitable remedy for colds, flu, and fever in children. 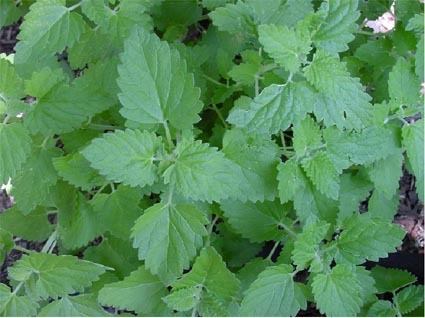 Catnip is markedly antiflatulent, settling indigestion and colic. It is also useful in treating headaches related to digestive problems. A tincture of the herb makes a good friction rub for rheumatic and arthritic joints, and as an ointment, treats hemorrhoids. Cautions: Do not take if pregnant (Chevallier 239).